Howard Leight by Honeywell AirSoft silicone rubber ear plugs set the standard for washable, reusable and inexpensive industrial general noise protection ear plugs with an excellent rating (NRR 27). AirSoft reusable ear plugs are ideal for regular wear while working around the home shop, use in dirty environments and daily use in the workplace. The economical price of these plugs makes them a terrific alternative to disposable foam ear plugs. The ultra-thin 4-flange design lets these plugs fit nearly everyone, providing a consistently excellent acoustical seal against dangerous noises. Howard Leight AirSoft Reusable Ear Plugs w/Red Poly-Cord (NRR 27)5tarawa1943November 29, 2012They work well on outside ranges, with .22 lr, with big bore stuff they need use with muffs to block percussion, it is hard to hear the range commands with muff+NR27's corded. Howard Leight AirSoft Reusable Ear Plugs w/Red Poly-Cord (NRR 27)5JackieFebruary 6, 2012My husband is a tunnel miner and ear protection is a part of their required PPE (personal protective equipment). This is my second purchase from this site. First I bought an assortment of ear plugs for him to try and this one was the winner. So we purchased 10. I should mention he has an abnormally shaped ear canal and this style works well in it. Best prices are here too. 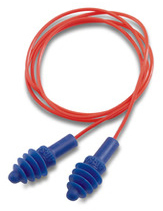 Howard Leight AirSoft Reusable Ear Plugs w/Red Poly-Cord (NRR 27)5Kevin - SCDecember 23, 2010I was recently hired in a plant that has real loud machinery running. They supply the foam earplugs which are ok, but I needed something else for a better fit. These earplugs were it!